Everyone knows the saying, “Once a Girl Scout, always a Girl Scout,” right? Well, did you also know that “Once a badge, always a badge?” YES! If you can find the retired/discontinued badges that you want (think eBay, Etsy, or even back-stock at your local Badge and Sash store and/or council online stores), then you can earn them with your girls! This is wonderful news for us here in the Girl Scouts of Greater Atlanta History and Archives Committee because that means that several awesome history-related badges that we thought were previously unavailable are now available again! One badge is a Brownie try-it called “Listening to the Past.” We’ve made a blog post all about this badge and the requirements involved and if you’re interested, click here to read it. Interview one or more older adults to find out about their lives. Ask them about dates, special events, or other important days that they remember. Create a painting, time line, or scrapbook showing these important experiences. Give it to the person you interviewed. Invite a person who is 70 years old or older and has a special hobby or skill to share it with your troop or family. Visit a person in a nursing home or senior center at least two times. Ask her about her live, share pictures from your life, teach her one of today’s songs or learn a song from her childhood. Find a way to assist an older person in your community. Help an older neighbor with her gardening, help a friend’s grandmother with chores, or read to someone whose eyesight is failing. With your troop create a list of community agencies, schools, house of worship, or organizations that help older people. Contact each organization and find out if it allo2ws girls to volunteer. If it does, what commitment is required? Does the organization provide training? Compile this information in a directory. Work with your leader or another adult to make copies of the directory available for people who want to do service project. Find women in your community who were Girl Scouts from 1912 to 1950. Invite them to share their Girl Scout memories with you. What has stayed the same in Girl Scouting? What has changed? Visit a nursing home, retirement home, or senior citizen’s center. Participate in an activity such as singing or a game or craft session. Or create a special activity that you then share with a group of senior citizens. Invite an individual over the age of 65, who is active in her career, to come to your troop or group and discuss what has made her happy and successful in her work. Find out how humor has changed over the years. Look at cartoons or comic books from 20 or 30 years ago. Ask your local librarian to help you find them. Next, read the funnies in your local paper or your favorite comic book. What’s different? What’s the same? Invite a senior citizen to do a cooking project with you. Prepare recipe she enjoyed as a youngster. Ask her how food preparation has changed. Are some ingredients that used to be easily available now hard to find? What new kitchen equipment has been invented that makes cooking much quicker and easier? Also for Cadettes, Seniors, and Ambassadors there is a badge called “Heritage Hunt.” Like the above Brownie try-it, we’ve written a blog post about this badge before. Click here to check out the requirements! These are just a few examples of the retired and/or discontinued history-related badges that can still be earned! There are plenty of others out there, all you have to do is a little searching. If you have any questions or need help with any of these badges, please contact us at GirlScoutArchivesAtlanta@gmail.com. 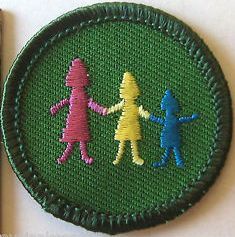 Posted on August 25, 2014, in Badges, Brownie Try-Its, Cadettes, Junior Badges and tagged badge, Brownie, Cadette, history, Junior, retired, try-it. Bookmark the permalink. Leave a comment.